Four museums in One: An elegant building that, in its pale and austere simplicity, is the perfect foil for its surrounding neighbours in the Museum Quarter. Inside, Modern and Contemporary Art, Works on Paper, Museum of Architecture, Museum of Design and Applied Arts, and, in a surprising subterrainian space, an excellent contemporary jewelry collection. Achtung! Achtung! you say. But wait, there’s more – because it was Sunday, admission was only one euro. In the Modern and Contemporary Museum within the Pinakothek der Moderne, a thorough exhibit of 90 important paintings from major international museums and collections. Munich has excellent Beckmann holdings and he is well represented here, with many narrative pieces that are strong and disturbing in their intensity. This is true of the de Koonings as well, with their red hot energy and urgency. Some of Picasso’s early work (1920’s) is spare and has a more contemporary look than later pieces from the 1940’s. 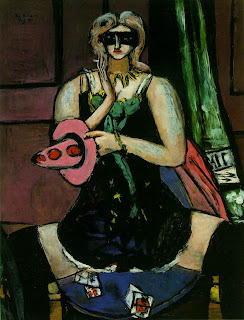 It crossed my mind, standing in front of a large lewd and riotous Beckmann tryptych, that this was painted long before the internet, and it’s pornographic base. The role attributed to women in their art is certainly one way to describe this astonishing exhibit. New neighbour to the Pinakothek, it’s a two storey rectangular building clad in 38,000 ceramic glazed tiles. A colour box that houses an international collection of modern art. Sauerbruch and Huttons Architects brought this one to life. Gorgeous. Walter De Maria’s magnificent marble ball is housed in this single work art gallery built in 1826 for the Royal Bavarian Infantry Lifeguards Regiment. Another worthy neighbour to the Pinakothek and Brandhurst. No lifeguards on duty here. Smack dab in the centre of Munich and at the edge of the English Garden, Sunday surfers ride the main wave.